The refreshing news that the US and Canada had reached an agreement, that would replace NAFTA, encouraged markets across the world today. Starting in Asia the Nikkei managed to add +0.5% even as Confidence (a Bank of Japan statistic) declined yet again. However, the Nikkei rally was at the expense of the Yen, which late this evening it breaking into a 114 handle. The other market that showed a similar pattern was the SENSEX. 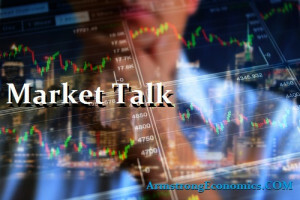 It too recovered in afternoon trading, although unlike the Nikkei, the SENSEX was in negative territory throughout much of the morning trading. Eventually, it closed up nearly 1%, but with the INR now comfortably with a 73 handle, fear is that all index gains could be negated by the currency decline. In Sydney the ASX fell around -0.6% on fears the Chinese economy continues to struggle. Data released Sunday in China showed more concerns as demand led growth declined both for internal and external markets. Due to national holidays we have not seen markets reaction to this data today, so will await the markets reaction. Lots of BREXIT headlines today as the Conservative Party conference got underway in Birmingham this morning. Key note was aimed at the EU in that the ‘Chequers Deal’ is the best they are likely to get – so take it or leave it! Well, that is what the frontline appear to be targeting, yet behind the scenes apparently, Boris Johnson is still rumoured to be job hunting. Meanwhile, the situation in European government bonds was less than settled again after rumours the EU would reject the Italian budget proposal. We ended the day with 10yr BTP’s out 15bp to 3.29%, the highest since early 2014. 10yr Greek debt has also started to drift wider in sympathy and both are dragging the Euro with them. European stocks were pulled between the latest trade talks, BREXIT and peripheral concerns. The DAX managed a bounce, but is more liking the weak currency than anything more constructive, while the CAC and FTSE played almost unchanged. The Euro is one market that is [probably worth keeping a close eye on this week. Interesting that the highs in US indices were hit in early trading, which tended to drift the balance of the day. Tech is still a weighty concern and so much so that we even saw the NASDAQ close negative. The Canada trade deal was supportive for large cap’s but is not really the news tech were demanding. That will probably come once the US/China deal is struck, but we will obviously have to wait that one out. The capital flow remains into the US Dollar and especially out of some Asian emerging market currencies. Being the first week of the month, many are already talking about Fridays employment report. It is the start of Q4 so it is doubtful we will have to wait until Friday before we start to see significant fresh capital flow. Japan 0.12%, US 2’s closed 2.82% (+1bp), US 10’s closed 3.08% (+4bp), US 30’s 3.22% (+4bp), Bunds 0.48% (+1bp), France 0.83% (+3bp), Italy 3.29% (+15bp), Turkey 17.18% (-13bp), Greece 4.17% (+5bp), Portugal 1.89% (+2bp), Spain 1.53% (+4bp) and Gilts 1.59% (+2bp).